….Around the world over the last century, the typical financial crisis caused the jobless rate to rise for almost five years, according to work by the economists Carmen Reinhart and Kenneth Rogoff. On that timeline, our rate would still be rising in early 2012. Even that may be optimistic, given that the recent crisis was so bad. As Ben Bernanke, Henry Paulson (Republicans both) and many others warned in 2008, this recession had the potential to become a depression. For partisan political reasons, Republicans find it in their interest to insist that the stimulus was just a boondoggle that hasn’t created a single job. The fact that this frequently gets reported with a straight face is a black mark for the press, which ought to insist on its sources being a wee bit more reality-based if they want to be quoted without being immediately debunked in the following paragraph. 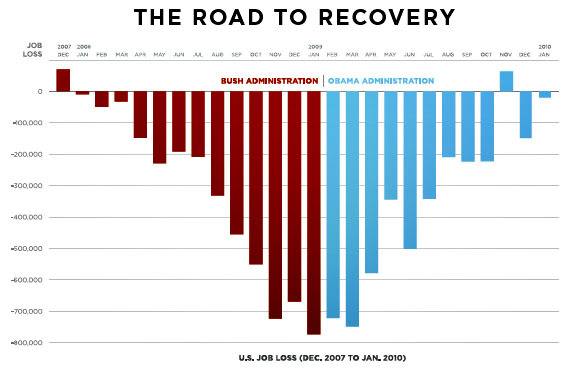 The chart below from Organizing For America tells the real story. We still have a long way to go before job growth is back to normal, but the stimulus is getting us there a lot faster than we would have gotten there otherwise.